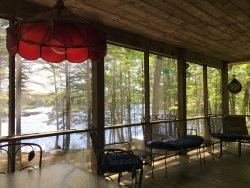 This Round Pond Cottage has unbelievable views and a premiere location for your vacation! There is a perfect deck/yard for watching the harbor activities. There is even a swimming waterfront with granite outcroppings and a shingle beach. Furnishings are low key and comfortable, the kitchen and two bathrooms are all new and sure to please. Most amazing is the sense of privacy and the stunning view. This is a great cottage in one of Maine's most charming Villages.